Jeffrey Welch's Blog: Ask a Vet: Why is My Dog Whining All the Time? Ask a Vet: Why is My Dog Whining All the Time? Is your dog whining all the time? One reader wrote in about this particular probably and Dr. Barchas offered up a few answers. My older dog (aged 10) has started whining a lot. She has weak back legs, but I can’t tell if she’s in pain or being a pain. She has become very attached to me since I retired last year. When the vet checked her back legs she poked, prodded, and rotated them, then said she had weakening and arthritis — and put her on tramadol — but said it was not painful for her. She’s whining as I write this! 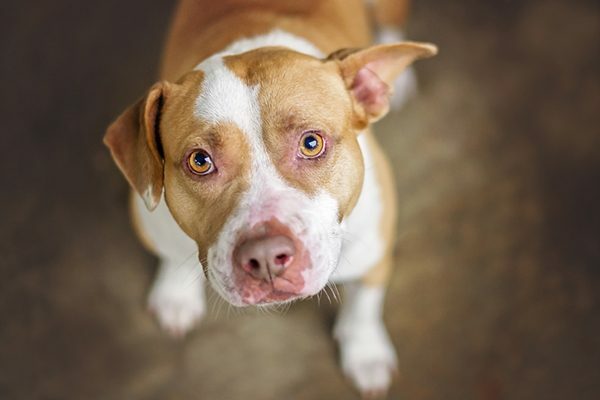 A Pit Bull looking sad. Photography by Demure Dragonfly/Thinkstock. Excessive vocalization (which is a fancy way of saying barking or whining — vets are taught from the start that a normal word should never be used when a fancier word is available) can be a sign of many things. Pain is certainly among them, but it is not the only possible cause of whining. Let’s start by talking a bit more about pain and its symptoms in dogs. Acute (or sudden) pain, such as that suffered after surgery, when a limb is broken or when a dog is in the throes of an ordeal such as bloat, usually causes whining. Chronic pain, such as that experienced with arthritis, often does not cause dogs to vocalize. Therefore, although hip arthritis is very common in older dogs (and may be playing a role in your dog’s hind limb weakness, and may indeed be causing pain), it probably is not contributing to the whining. Unless you are seeing other symptoms of pain — such as poor appetite, limping, guarding a painful body part, hiding or panting — then it’s unlikely that pain is contributing to the whining. The fact that the whining has not responded to tramadol, which is a pretty good painkiller, points to the same conclusion. Other possible causes include fear or anxiety, excitement (my pal Buster whines whenever he thinks we’re near a fetch field), certain metabolic or glandular disruptions, exposure to toxic substances, neurological problems, and cognitive changes. The whining from excitement, exposure to toxins and fear or anxiety is usually transient, and stops when the stimulus that causes it is removed. Ellen, since your dog is whining continuously, it is unlikely that the problem is due to one of these causes. That leaves metabolic or glandular irregularities, neurological problems and cognitive change. Unfortunately, I am most suspicious of cognitive change in your dog’s case. Cognitive change is a fancy way of saying deteriorating mental function, also known as dementia (remember what I said a few paragraphs ago about vets and fancy words). Some of the more consistent symptoms include whining or barking, loss of interest in favored activities, failure to greet or recognize the owner and loss of spatial recognition abilities, manifested by getting lost in formerly familiar environments. Cognitive change in dogs is similar to dementia in humans in a couple of ways. First, it is very difficult to diagnose. Humans can take cognitive function tests, yet cognitive decline is still hard to pinpoint. Dogs can’t take tests, so a diagnosis by necessity involves some guesswork. There is, however, one key difference between cognitive decline in dogs and in humans. A person with severe cognitive decline may have trouble truly functioning as a person. A dog with cognitive decline can usually still get along. Dogs can enjoy life without being able to drive, read, play chess or engage in other mentally demanding activities. Ellen, I’d recommend that you investigate your dog’s problems a little deeper. Have your vet run blood and urine tests to rule out metabolic and endocrine problems. Get a full neurological evaluation to assess for other possible causes of whining. If, in the end, your dog is diagnosed with cognitive dysfunction, talk to your vet about the options. Although b/d and deprenyl aren’t always effective, sometimes lifestyle changes or intermittent use of sedatives can make a difference. Thumbnail: Photography by Irina Kozorog/Shutterstock. Is Your Dog Snoring? Do All Dogs Snore? The post Ask a Vet: Why is My Dog Whining All the Time? appeared first on Dogster.